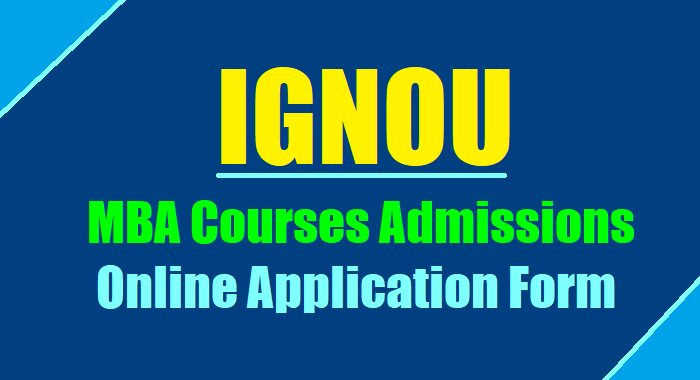 IGNOU MBA Administration, MBA (Banking & Finance) Admissions 2018 Notification, Online application form. IGNOU Announces Admission to MBA(B&F) for January 2019 session. The MBA (Banking & Finance) Programme, specifically designed for Bankers, is offered through countrywide network of Study Centres of IGNOU. Developed collaboratively by School of Management Studies, IGNOU and the Indian Institute of Banking & Finance (IIBF), Mumbai, the Programme uses standard IGNOU multi-media design and technology aided delivery systems. The University announces admissions to the MBA (Banking & Finance) Programme for the session commencing January 2019. IGNOU admissions 2018: IGNOU announces admission to Management programmes for January 2019 session. Indira Gandhi National Open University (IGNOU) has announced the admission process to its Management Programme for January 2019 session. All the below programmes have multi-media design, and technology aided delivery systems. The candidates who want to apply for the MBA course have to appear in the entrance examination ‘OPENMAT-XLIV’ to be held on December 16, 2018. The candidates can apply online through the official website, onlineadmission.ignou.ac.in. The online window for the application process will be closed on November 15, 2018. MBA: The candidates have to possess a Bachelor’s degree in Chartered Accountancy/ Cost Accountancy/ Company Secretaryship with 50 per cent marks for General category and 45 per cent for reserved category. There is no age restrictions to apply for the course. Specialization Post Graduate Diplomas: Any Graduate (including Chartered Accountancy/ Cost Accountancy/ Company Secretaryship) with 50 per cent marks for General Category and 45 per cent for Reserved Category candidates. There is no age restrictions, and the candidates do not have to appear in the entrance examination. The Indira Gandhi National Open University (IGNOU) has on Monday announced admissions to the MBA (Banking & Finance) programme for the session commencing January 2019. The last date to receive to submit the application forms is by November 15, 2018. This programme has been designed keeping in mind the professionals working in the banks. The same is being offered through countrywide network of study centres of IGNOU. The programme has been developed jointly by School of Management Studies, IGNOU and the Indian Institute of Banking & Finance (IIBF), Mumbai. The programme would be offered through the ODL mode and uses standard IGNOU multi-media design and technology aided delivery systems. Education: The aspirant should be a graduate of not less than 3 years duration from a recognised university/ institution. The candidates have been working in the banking or financial services sector for a period of at least two years. The prospectus can be obtained from the Director, Student Service Centre (SSC), IGNOU, Maidan Garhi, New Delhi-110068 or from any of the regional centres of the institute. The candidates have to pay Rs 1000 in cash, or through post by sending a demand draft of Rs 1050. The application form can also be downloaded from IGNOU official website — ignou.ac.in. (c) have been working in the Banking or Financial Services Sector for a period of at least two years. OR Professional Degree with 50% marks in: Engineering/ Medicine/ Chartered Accountancy (ICAI)/ Cost and Works Accountancy(ICWAI)/ Chartered Secretary-ship (ICSI), and Law. Administration (MBA) Programme: Starting its operation in 1987, the School of Management Studies today offers a wide range of courses. The School follows a system of course-wise registration in its Management Programme. • Integrative Module - consists of two compulsory courses (MS-91, MS-95) and one elective course out of any 5 elective courses (MS-92/93/94/96 and 97) and a project course which is equivalent to two courses (Thus making a total of five courses). ‘Student Handbook & Prospectus of MBA(Banking & Finance)-2018-19’ can be obtained from the Director, Student Service Centre (SSC), IGNOU, Maidan Garhi, New Delhi-110068 or from any of the IGNOU Regional Centres whose addresses are listed in the website, in person on payment of Rs.1000/- (Rupees one thousand only) in cash, or through post by sending a Demand Draft of Rs.1050/- (Rupees one thousand fifty only) drawn in favour of ‘IGNOU’ payable at the city from where the Prospectus is requested. Please write your name and address and ‘MPB’ on the reverse of the DD and send your request to the concerned IGNOU Office. The Application Form can also be downloaded from IGNOU website: <www.ignou.ac.in> Student Support > Downloads > Prospectus MBA(Banking & Finance), and submitted along with a DD of Rs.1000/-, in addition to the Programme fee.